The cabin and location are fantastic! Very nicely finished cabin. The separate "guest cabin" is a great option for those of us with differing schedules from the rest of the group. The only con is the driveway is not for timid or distracted drivers. I've rented cabins from Cascade, off and on, for the last 15 years or so, and your service has always been top notch. In this case, one person in our party (my son) contacted you regarding bringing a pet to this property, as an exception to its no pets status. We really appreciate that you asked the cabin owners about this and they agreed. I completely understand the reasons for a no pets status but we appreciated the consideration. In case it's helpful to know, we have rented Table Rock cabin in recent years. We love many things about that cabin but the marginal maintenance, uncomfortable beds and leaky screens that let in mosquitoes, led us to try a different cabin this year. 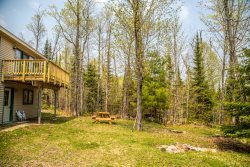 Sunrise Hollow is a gem of a cabin--classic but updated, cozy but open, with a great view of Lake Superior from inside the cabin. Sitting at the dining room table, one feels like they're eating right on the lake shore! The beds and furniture were super comfortable and the cabin was very well-equipped. The adorable guest house allowed members of our family privacy, with togetherness when we wanted it. Outside, we had a hard time choosing whether to sit on the rocky lake shore or on the grass, next to the lovely flower garden, overlooking the lake. Bravo to the cabin owners and Cascade on offering such a high quality property! The ride was very long but well worth it. Loved that the lake was a few steps away from the house. House was beautiful- could use a tub drain stopper for baths though!